A lot of discussion about deep/machine learning in the telecoms industry focuses on either customer management, or applications in various enterprise verticals. Typical use-cases are around assisted self-care for end-users (for example, diagnosing WiFi configuration problems), or spotting customer behaviours that suggest imminent churn (or fraud). Some telcos are looking at chatbots or voice assistants, for example for connected-home applications. Then there are offers around image recognition, perhaps for public-safety use, where telecoms operators have traditionally had a major role in many countries. All this remains very important, but recently, I've been seeing a lot more "behind-the-scenes" use-cases being discussed, as both mobile and fixed operators look to improve their operational effectiveness and cost-base. Many of these are less-glamorous, and less-likely to highlight in non-telecoms articles, but they are nonetheless important. BT has talked about using ML to improve efficiency of maintenance staff schedules, depending on particular tasks and base locations. As well as traditional telecom operators, new breeds of Internet-based communications providers are also looking at instrumenting their services to collect data, and optimise for multiple parameters. For example, Facebook (which is a "new telco") is improving its voice/video Messenger app, by collecting data from its 400 million users. This involves not just call "quality", but maps codec use to battery levels on mobile devices, and various other measureables. Potentially this allows a much broader type of optimisation than just network-centric, by considering the other trade-offs for users such as length of call vs. power consumption vs. video quality. The key for all of this is collection of operational data in the first place, whether that is from network elements, end-user devices - or even external data sources like weather or traffic information. I'll be digging into this in various future posts - but I'll also be speaking at various conferences and panel sessions about Telecoms & AI in coming months. In January, I'll also be covering AI at the PTC'18 event in Honolulu from Jan 21-24 (link here). And in April, I'll be at the AI Net event in Paris (link here) moderating a panel and also talking about AI in smartphones. Overall - I'm expecting a huge #TelcoFuturism push around all aspects of AI in telecoms in 2018, but it's especially the operational and network-management functions that I think will make a big difference. 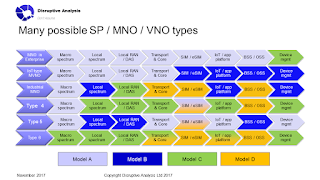 It also coincides with the arrival of both 5G and large-scale NFV, and the intersection points will have a further multiplicative effect. At the end of May, I co-ran a day-long workshop with Caroline Gabriel covering enterprise and private LTE, for industry verticals, neutral-hosts, indoors, government and other environments. We had c20 people involved, with a mix of presentations, group discussions and exercises, and ample time for networking. The event was held under Chatham House rules, so people could talk confidentially without direct attribution of comments. Six months later, we're repeating the workshop, on December 1st in Central London. A limited number of places are available. New mobile devices/applications and the emergence of the Industrial IoT means that high-quality – often mission-critical – networks are required for new systems and applications. These can span both on-premise coverage (eg at a port, factory, office, wind-farm or hospital) and the wide-area (eg for smart cities or future rail networks). Regulators in some markets have actively looked to provide frequency ranges for public safety, large businesses and other uses. Every spectrum conference I've been to has had a session or two on shared bands, and is also taking unlicensed technologies more seriously. Rules on CBRS have solidified in the US, albeit with possible changes proposed to the FCC. Many industries and major companies (eg the oil sector) are seriously engaged. MulteFire is looking "real", with deployments (and devices) expected next year. Vendors including Nokia, Ericsson and Huawei have all indicated growing interest in private cellular, as well as host of smaller players, or WiFi specialists looking to add cellular radios. 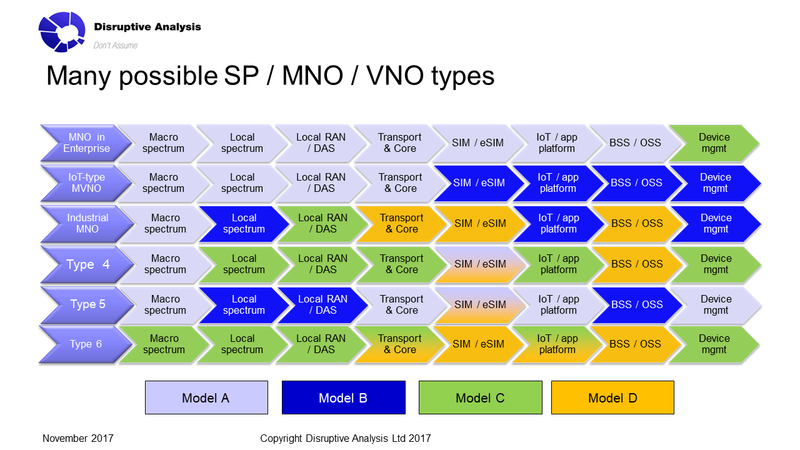 The 5G community is recognising that "verticals" may not always be best-addressed by traditional MNOs, and may require new models. Even most operators concede that they can't do everything - especially for industrial IoT connectivity or uses with heavy legal liability or certification requirements. Various large industrial and utility/rail players have shown a lot of interest in private LTE, alongside WiFi meshes, LPWAN and other vertical-oriented network technologies. Community, rural and emerging-market players have started to look at cellular in unlicensed/shared bands to reduce costs and improve coverage. The day will have a maximum of 30 attendees to ensure a high level of discussion and interaction. We expect a diverse mix of service providers, vendors, regulators and other interested parties such as enterprises, investors and developers. It will be suitable for C-level executives, strategists, product management, marketing functions, CTO office, market analysts and regulatory affairs specialists. It will be led by myself and Rethink Research’s Caroline Gabriel (link). We are both well-known industry figures, with many years of broad communications industry analysis – and outspoken views – between us. Spectrum-sharing, including unlicensed, light/local-licensing and CBRS-type models. What bands are different countries' regulators looking at? 2.6GHz, 3.5GHz, 4GHz, 28GHz, others? How will voice & UC & push-to-talk work on private cellular networks? (I've covered various of these themes in previous posts and presentations. If you want more detail about some of my thinking, see links here and here and here. We will be going into a lot more depth in the workshop itself. And for a quick 20-minute “taster”, see the video of my presentation from the recent TADSummit event in Lisbon. The workshops will take place at the Westbury Hotel in Mayfair, central London [link]. It will run from 9am-5pm, with plenty of time for networking and interactive discussion. Come prepared to think and talk, as well as listen – these are “lean-forward” days. Coffee and lunch are included. The attendance fee is £699+VAT, with a discount for a second attendee. Payment can be made via credit card (see Paypal Buy Now button below), or purchase-order & invoice on request.